Campsite’s programmatic buying platform has been presented to countless advertisers and media buyers and as a testament to it's reception we currently have nearly 100 activated accounts in Canada and growing. Interestingly, 55% of these buyer accounts had never executed a campaign on Newad inventory before becoming aware of Campsite. Campsite DSP is being used by a variety of clients including direct advertisers, programmatic trading desks and smaller agencies specialized in digital strategy, creative or marketing services. The majority of activated accounts are larger national agencies with a broad range of services, and this category accounts for 35% of all transactions so far. 58% of these transactions came from programmatic trading desks that have, for the most part, been eager to access new premium video inventory. The campaigns executed by these buyers targeted Newad’s remnant digital inventory and over 80% of the transactions paid under 0.08$ per view for completed views of 15 second video ads (for more on how views are counted, see here). Campsite’s DSP allowed buyers to track campaign delivery in real-time with customized dashboards. 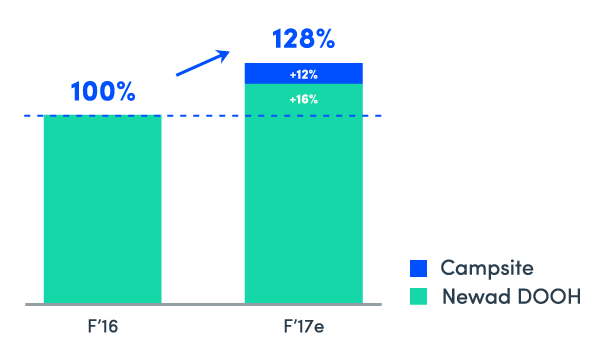 The overall impact of monetizing this remnant space on Newad was a 12% increase in its incremental F2017 digital dollars– amounting to 9% of its overall digital revenues for that period, as illustrated in the graph below. "It’s remarkable that I can open my dashboard in the morning and see income revenue in real-time coming from new advertisers. Some of these campaigns appear to have been planned and executed in the same day, and others last for months, so there’s now consistent revenue coming in through Campsite." Needless to say, it’s been a busy first year for Campsite and we feel the results with Newad are a big success. It’s been a year full of learning, and Campsite’s clients – both on the supply side and on the buyer side – have provided tremendous insight. A lot of new and exciting changes are coming in the near future. Most importantly, Campsite is now introducing real-time bidding as well as new suppliers and new environments, in addition to Newad’s Restobar network. We expect that these changes will attract a bigger volume of buyers and transactions. Campsite for Suppliers - or the supply-side of the platform - allows suppliers to set their minimum floor price and make adjustments as necessary. Given that premium DOOH inventory is scarcer than overall ad inventory on the web, we don’t expect floor pricing to be the norm, but demand will dictate that in the end. Suppliers control which and how much inventory is made available programmatically through Campsite at all times. To find out more, check us out at www.campsiteproject.com and request and account! Almost a year ago, Campsite’s fully automated buying platform, specialized in out-of-home inventory, was launched in Canada. Now, on the tail end of our first year in the Canadian programmatic buying market, we’re proud to launch Canada’s first open exchange totally dedicated to Digital Out-of-Home. The Residential Network gets advertisers past the locked door of lobbies and enables them to display their ads alongside timely, around-the-clock building-specific information, local weather, and news. The insight? Good things happen when you adapt your messaging to fit into your audience’s daily schedule. The respectful familiarity that exists among like-minded tenants, coupled with the safe environment of the place they call home, makes residential buildings a great place to achieve meaningful brand integration.